Antwerp, 1608 or 1612, Italian edition. 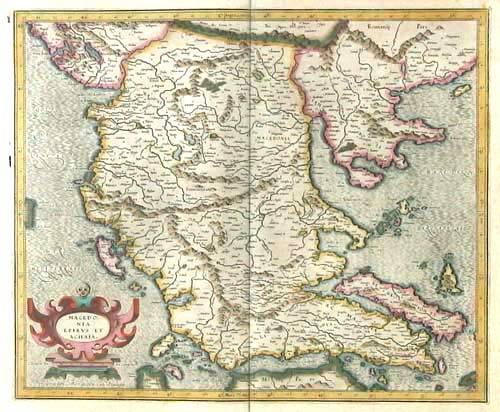 A map of Greece and the Aegean from the world's first systematic atlas, the 'Theatrum Orbis Terrarum', based on a map by Giacomo Gastaldi (c.1500-66). Amsterdam, c.1640. Dutch text. Northern Greece, with Athens, Thebes and Corfu, as well as modern Albania and Macedonia. Paris, c.1692. 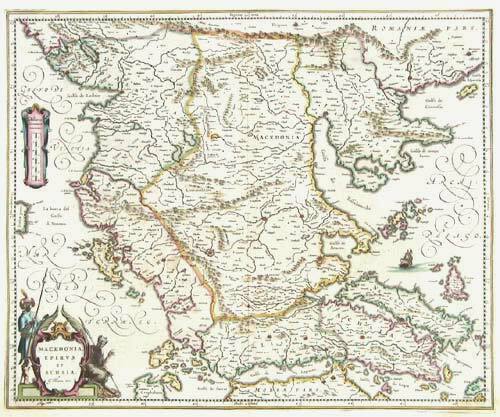 Greece, engraved by A. de Winter for the quarto edition of Sanson's atlas. 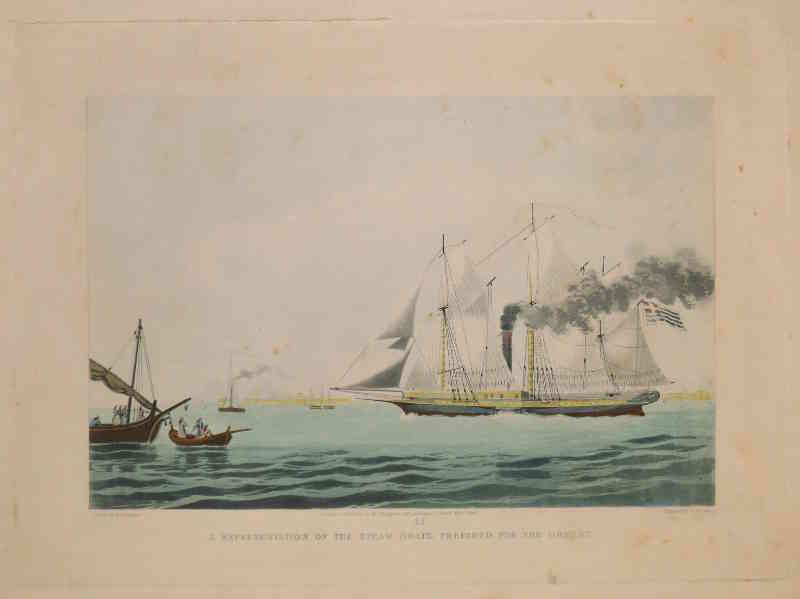 London: Huggins, 1826, but c. 1880, A later printing of a scene, showing a ship apparently prepared for the Greeks during their struggle for independence from the Ottoman Empire. 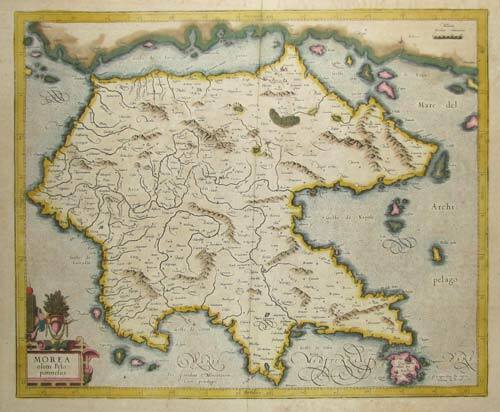 Amsterdam, Jodocus Hondius, 1613. 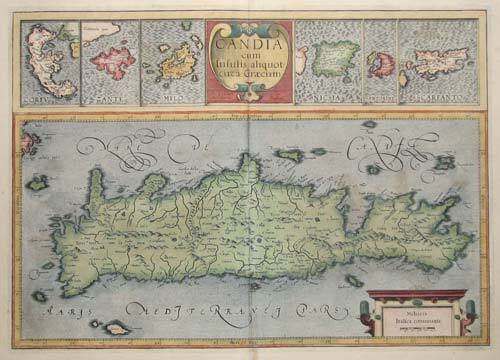 A decorative map of Crete, with insets for the six other islands: Corfu, Zakinthos, Milos, Naxos, Thira & Kárpathos. Amsterdam, Jodocus Hondius, 1613. Map of Northern Greece, including Athens, Salonika and Corfu, and Albania and Macedonia. Amsterdam, Jodocus Hondius, 1613. 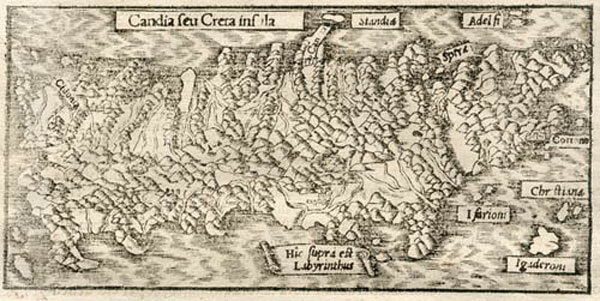 The Morea by Gerard Mercator, famous for devising the famous Mercator Projection of the world. A very decorative map.